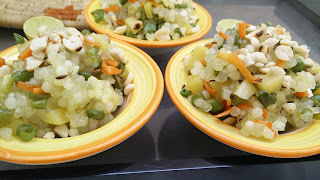 Sabudana Khichdi is very common recipe which is usually prepared during fast or in Navratra days. It is very healthy, filling meal to take during these days. 1. Soak sabudana for 2-3 hrs till it puffs up nicely. Then spread it on a muslin cloth till it is dried completely and is not sticking. 2. In a non stick pan heat little ghee. Sauté cumin seeds, curry leaves, vegetables for 5 min. Add salt, red chilly powder. Mix well. Add sabudana and little water. Cook it for 5—10 min. 3. Once done, sprinkle lemon juice and garnish with crushed roasted groundnuts. Serve hot.